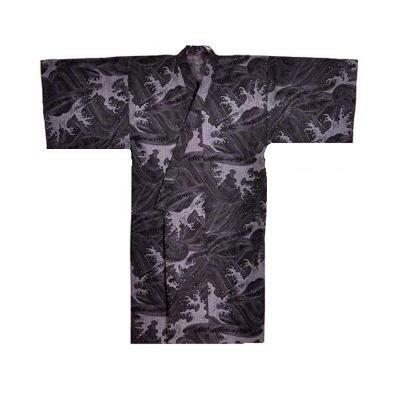 This smaller version of our most popular men's robe is a Japanese Happi Coat inspired by the Great Wave off Kanagawa, one of the best recognized works of Japanese art. This Japanese robe is features a classic wave pattern, symbolizing the powerful currents of the ocean. The men's robe is richly detailed in shades of gray, black and white. Made of soft 100% shrink resistant cotton, it is easy to care for. This Happi coat has a pocket and comes with a matching belt. Medium/Large, measures 45" in length and is designed to fit a man 5' 5" to 6' in height. The sleeve length is 14", shoulder width is 29" and the girth is 56". Girth means the entire width of the robe from end to end without any fold over. For length, you can measure yourself with a tape measure from the top of your shoulder and down your side to determine where the length would fall on you.